According to the Canadian constitutional law professor his native land, which Albert calls “one of Haiti’s most loyal friends”, should administer the Caribbean island nation. 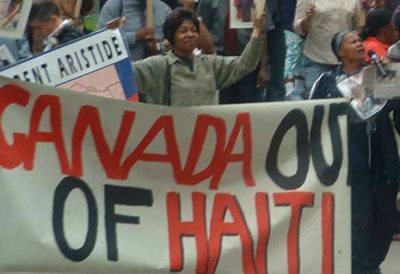 Four months after Ottawa helped overthrow Haiti’s elected government Prime Minister Paul Martin reaffirmed his government’s desire to keep Haiti under long-term foreign control. As I discuss in the current issue of Canadian Dimension magazine, leftists have long supported the expansion of Canadian power in the region. In a 300-page thesis titled “Dreams of a Tropical Canada: Race, Nation, and Canadian Aspirations in the Caribbean Basin, 1883-1919” Paula Pears Hastings outlines the campaign to annex territory in the region.